Has your hair taken a beating from Old Man Winter? Use these Winter Hair Care Tips to combat dryness and try our Original Mineral products to give your locks the tall drink of water it’s been craving! During the winter season, your hair needs external hydration because the dry weather robs it of all moisture and oils. Conditioners and masques help to soften the hair, add shine, reduce static, improve texture, and they act as a coating to keep the hair protected. 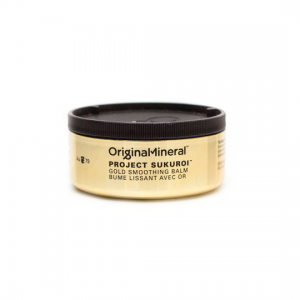 If you’ve been to the salon lately you already know that we’ve been loving the Original Mineral line. They’ve left out harmful everyday chemicals found in many cosmetics such as PHTHALATES, SULFATES, PARABENS, PROPYLENE, GLYCOL, M.I.T. and TRICIOSAN. 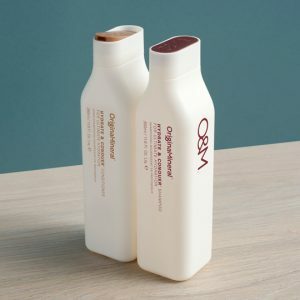 O&M has replaced these toxic chemicals with natural native actives from Australia that deliver many benefits while nourishing and protecting the hair. A 20 minute hot shower might feel great on a freezing cold day, but try to avoid submerging your hair while the heat is turned up. Long exposure to hot water can strip moisture from hair and skin. Stick to lukewarm or cool water for those parched strands. Cool water closes the hair’s cuticle and locks in moisture so turn down the heat – even if it’s only in the last 2-3 minutes as you’re rinsing conditioner from your hair. 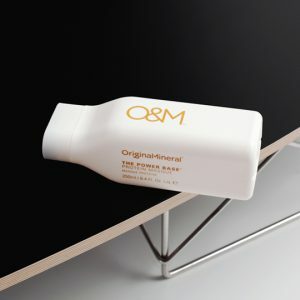 For a dose of hydration next time you wash, try the O&M HYDRATE & CONQUER formula. Give dry, damaged or colored hair some TLC with nutrient-rich Tasmanian Sea Kelp, containing Vitamins A, B, C & E and 13 amino acids to strengthen hair and stimulate growth. This intense dual action treatment works to restore your mane from within. Wheat Protein reconstructs weakened hair to bind broken strands while Apricot Kernel Oil and Sweet Almond moisturizes and nourishes the hair’s exterior. Washing your hair too much can strip away healthy oils and lead to dry, damaged ends. Keep shampooing to only 2-3 times a week and extending the time in between washing by using a dry shampoo at the roots. This will help keep your mid shaft and ends hydrated by the natural oils from your skin and scalp, and will maintain volume at the roots. A great way to combat static from dryness in the air is to use a protective heat styling product. This is hands down one of our fave products that delivers a smooth and featherlike softness to the hair that your sure to love. It can be used on damp hair prior to heat styling, or on dry hair to restyle or tame frizz and flyaways. Project Sukuroi will help reconstruct even the most damaged hair, it has a unique smoothness that will make hair feel like it’s virgin state. Regular trims are a great way to keep your hair in good health during the winter months as well. Every six to eight weeks, make sure to schedule a light dusting of the ends to help reduce the chance of dry, splitting ends. Our newest talent, Laura Kevil, is offering special pricing on cuts for a limited time: $20 for Men and Kids, $25 for Teens and $35 for Women. At this incredible intro pricing, there’s no excuse for prolonging your family’s salon visits. Visit our Yelp page to read the rave reviews Laura has been getting, then click here to book your appointment with her today!